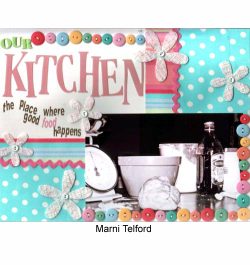 Marni and her husband love to cook together, so it was only fitting that one of her "At Home" layouts be dedicated to the kitchen and the food that comes out of it. In this particular photo Marni was in the process of making fresh pasta. Marni has developed a love for buttons over recent months and with the fabulous colours in the Michael Miller Fabric she could not resist adding some SEI buttons to her page. She used them to frame part of her photo as well as filling in some unwanted space and balancing her layout. Marni used Michael Miller fabric flowers to soften and continue the fun feel of the layout. 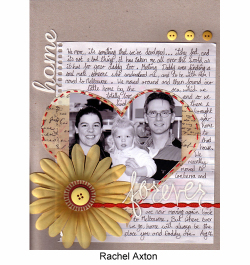 Her journaling on this layout was done using the Li'l Davis Rub ons. 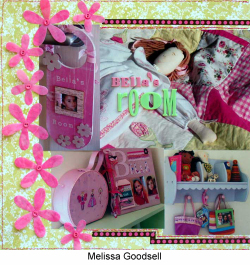 Mel wanted to capture some little snippets of her daughter Bella's room, so that in years down the track Bella will be able to reflect back and remember some her favourite things, and see how much her tastes have changed. Bella's quilt and doll were handmade by her Nan and Mel wanted these to be a feature of the page, so she enlarged this photo and placed the title over the top to draw the eye to the photo and title. Mel added a scattering of Michael Miller Fabric Flowers down the side of the page to create a border and enhance the girly feel of the layout. 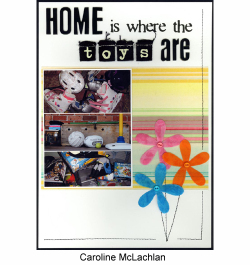 Mel has used BasicGrey Lily Kate paper and some Heidi Swapp tape, as well as Heidi Swapp Plastic letters for the title. With this layout Rach wanted to document their move back to Melbourne and how the physical house in which they live is not what defines home to her - for Rach it is the people contained within the house that mean and define home to her. The layout is kept simple to focus on the story. Michael Miller stiffened fabrics are great because you can cut them to any shape and they will not fray unless you tear instead of cutting, allowing you to control the way they appear. This pretty much sums up the McLachlan house. Though as Caz's girls are getting older their "toys" seem to be more sporting gear and less Bratz related. Jess, her son, on the other hand seems to have more toys than the girls ever had combined, and like most boys, he's not real fussed on putting them away. Caz has used Michael Miller Colourband pink fabric paper, as well as some fabric petals. The title is created using Heidi Swapp Centre of Attention chipboard letters and Carolees Creations Love Worn black twill letters. Machine stitching creates the flower stem and a half of the border. This photo is of a space in Tamar's expedite in her scraproom filled with books - the colours are quite eclectic as to be expected so Tamar dulled the colours down in photoshop to give a older world feel to the photo. 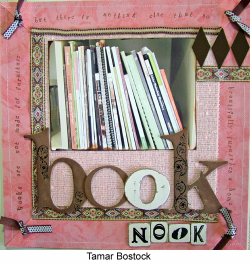 Tamar searched the quote garden to find a suitable quote for her layout rather than journal about how much the books mean to her. The quote stamped around the edge sums that up quite nicely. Books are not made of furniture but there is nothing else that so beautifully furnishes a home. The Michael Miller fabrics are so easy to work with; already stiffened just like a 12x12 piece of paper - beautiful to sew and add great texture to the page. Tamar has built this layout using Tweed cotton and ribbons to achieve the pieced background look. The Dining room - a hub of chatter and get togethers in Nic's household - all dinners and most breakfasts are a family sit down at the table - where the days events are normaly talked about. Nic has used a mixture of fabrics from Junkitz, Michael Miller Memories and some SEI velvet to create a warm feel for this layout. 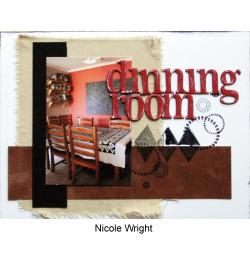 By stamping onto the fabrics to create a little pattern she has kept in theme with the dinning room, and earthy warm feel.